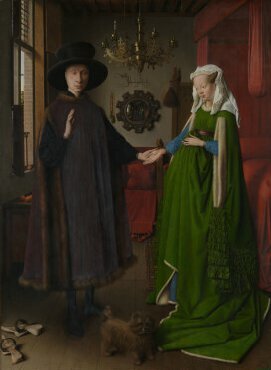 The Arnolfini Portrait was painted in 1434 by Jan van Eyck using an early Netherlands style which is of the Northern Renaissance family. As a representation of the marriage of Italian merchant Giovanni di Nicolao Arnolfini and his wife. There has been some considerable discussion on whether this painting is a marriage contract, a depiction of a wedding or simply a brothel. Regardless of the origincs the picture offers some insight into life during that time. The picture is one of illusionism that was remarkable for its time. The author completed multiple layers of the painting to create a realist depiction of the couple. In addition, there was symbolism of wealth with the rich clothing, religiousness with candles, loyalty of the dog, and the way in which the hands are help. The picture has more meaning than what one actually first sees. It can be argued that the dog depicts loyalty among the couple. While beds in waiting rooms are common the red curtains indicate a sensual nature of the union. The way in which the hands are portrayed between the couple also indicate similarity of marriage rank. Paintings had much more meaning than many of the paintings today. While I wouldn't call today's paintings "watered down" I would say they had a more prominent part of life for the wealthy. There were no cameras so the best way to create a scene was to paint one. This took lots of energy and artists were as much poets and philosophers as they were anything else. Symbolism was a method of saying things without actually having to "say" things so that the messages had depth and were dynamic.